For my main illustration website (www.mdubillustrations.com), I was planning on adding a full-color lizard drawing. 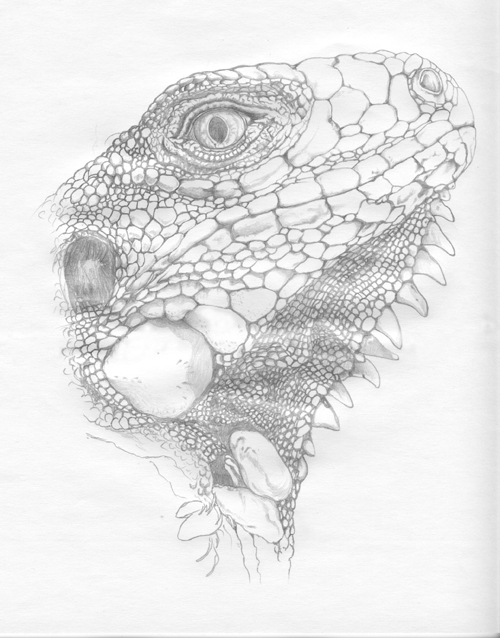 I thus started experimenting with various black and white sketches, and I became so absorbed with all the scale details and big throat sacs of iguanas that I couldn’t help myself but draw a very detailed sketch of a green iguana! It’s interesting to see how all these scales and big fat reserves in the cheeks actually look like jewelry. I have no idea how long it took me to draw this sketch, but the process was very enjoyable!